you learned how to communicate with team members by using Project 2000 workgroup features. But TeamAssign, TeamUpdate, and TeamStatus don’t allow team members ta>’get-the overall picture.” Nor do they allow others with interest in a project (such as senior managers and stakeholders) to view project information. That’s where Project Central comes in. 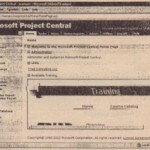 Project Central operates within a browser window. In its simplest form, it is a Web site devoted to tracking your company’s active projects. 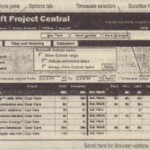 At its most complex, Project Central is a database of Project 2000 files and fields with detailed security to control who can access the database and what they see when they do. Managers post reports, views, and other information for their team members. They can access work group features to send the Team Status Team Assig and Team Update messages previously discussed Stakeholders can log on to see reports and views for which they have permissions. Team members can see their task assignments and deadlines for all projects. They can send status updates to their managers and look at certain views from the Project files for which they have assigned tasks. Setting up, configuring, and administering Project Central requires a bit of time and patience. (See Chapter 26, “Installing and Administering Project Central 2000.”) But once it’s running, users-including project managers-should find it fairly easy to navigate. The logon authentication is an essential part of Project Central security. If an employee who is not a member of a project team stumbles across the URL for Project Central (intentionally or unintentiop.ally)! they can’t get into project information without a user account. 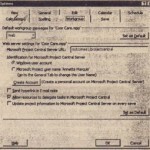 (See “Understanding Project Central Permissions” later in this chapter.) Although there are links on the login page that make it look as if anyone can get in, when you click them you won’t get far unless you’re an authorized user. 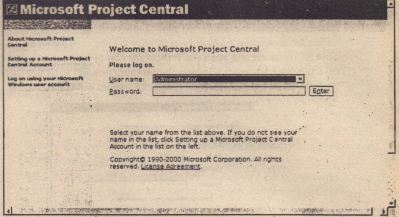 The Project Central Administrator can opt to have users log on by using their Windows NT username and password. If that’s the case in your organization, click the Log On Using Your Microsoft Windows User Account link and enter that information in the appropriate fields of the Enter Network Password dialog box. Home For general information, links, password options, ernail, and email rules.Tasks For viewing personal task lists and Gantt Charts, uploading Outlook calendar information, changing scheduled work hours, creating a task request, and delegating tasks (with appropriate permissions). Views For looking at task assignments for all projects you’re working on and for viewing other resource information for which you’ve been given permissions.Status Reports For requesting and responding to status reports, as well as viewing reports submitted by your team members. 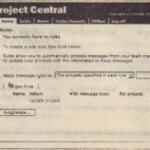 Project Central is a Web site. Therefore, you can navigate to different pages as you normally would on the Web. (Mouse over the link you want to follow. When the pointer shape changes to a hand, click the link.) Project Central’s Home Page provides multiple links to the pages listed above. For instance, if you want to navigate to Tasks,you have at least five choices: click the Tasks link in the middle of the Home Page, click the Time sheet link slightly below the Tasks link just mentioned, click Tasks in the Actions pane (or any of the subtopics listed under the Tasks heading), click Task son the Navigation.Bar,or mouse over Tasks in the Navigation bar and then choose a subtopic.